Globefunder's site got a new layout. It looks more structured and professional now. 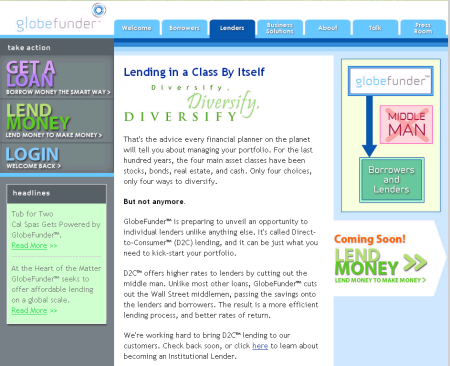 Also it seems that Globefunder will open its d2c lending (d2c="direct to consumer") to individual lenders. Only in May an announcement of Globefunder sounded like under dtc lending the company would on the lender site be open only to institutional investors. We're sorry, that option isn't available yet at GlobeFunder.com. Please check back again soon, as we continue to make improvements to the site. Globefunder announced the launch of Globefunder India, which it claims is the first p2p lending service in India. 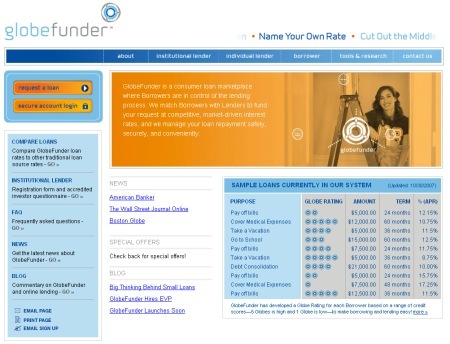 GlobeFunder India is now up and running, making us the first online lending marketplace to establish operations there. If you are a lender in India, the good news is that you will soon have a way to capitalize on one of the most vibrant and fastest growing economies in the world. While in the U.S. lenders can access borrowers directly, in India the sheer size of the lending market and the regulatory environment necessitate a slightly different approach. In partnership with global managed services provider Intellecap and some of the leading banks in India, GlobeFunder India links lenders and borrowers through a network of well-established Micro Finance Institutions (MFIs).These MFIs are rated based on their credit worthiness similar to individual borrowers on the U.S. GlobeFunder marketplace, and these MFIs in turn work with individual borrowers through their extensive on-the-ground networks. According to Globefunder there is an unmet loan demand in India of 40 billion US$. If you are an Indian resident and use Globefunder India, please share your experiences in the Globefunder forum of Wiseclerk.com Thank you. 2007 was a year of launch and growth for most players. What trends in peer to peer lending can be expected in 2008? In many markets multiple p2p lending services will compete for the attention of lenders and borrowers, especially in the largest market: In the United States Globefunder.com and Loanio.com will launch. In other markets, where there is no national p2p lending service established yet (e.g. Canada, New Zealand, Spain), p2p lending will be introduced by the launch of a service. Not totally new, since Boober.nl and Smava.de already offer some protection of the loan principal. Insurance can be implemented as a classical insurance product (supplied by an insurance company) or as a market mechanism, spreading the risk over multiple loans. One of the disadvantages for lenders currently is that on all p2p lending platforms, the invested money i locked in for the duration of the loan term. Prosper.com has allready announced that it plans a secondary market, enabling lenders to sell and buy loans any time. Depending on the market there are huge regulatory hurdles to allow trading of loans. For example German executives told P2P-Banking.com that on the German market a secondary market is unlikely for years to come. Aside form the social lending approaches (Kiva, MyC4, Microplace) so far all service are open only for lenders and borrowers that live in the same market. If lenders could lend to borrowers in markets with higher key interest rate than the market the lender lives in, the advantages could outweight the risks. In the European Union due to the Euro zone there would be no currency exchange risk. Again there are steep regulatory hurdles to be taken. So far all loans are for fixed terms (prepayment allowed) with fixed interest rates. Variable interest loans could add flexibility. The interest rate could rise or decline following an indicator (e.g. market prime rate). Another possibility would be a mechanism where the variable interest rate would rise or fall as a result of the level of defaults of the credit grade. This could protect lenders, if the actual default ratio is higher then the forecasted default ratio. Just a thought. Lenders could allow a third party to manage their portfolio. Like an investment funds the lender would invest an amount of money, while the funds manager does the actual selection of loans. This could possibly be done by a sophisticated software (would you trust this?) selecting loans by statistical analysis of performance of loans with similiar parameters or by a fonds manager. The later is unlikely because the amount of time needed for each loan is too high to be covered by fees. I'll check at the end of 2008 to see how these trends developed. Globefunder is now open for loan request by borrowers (minimum credit score of 640 required). The signup for individual lenders at Globefunder is still "coming soon". Interest rates for borrowers on GlobeFunder range from 8 percent to 20 percent. GlobeFunder makes its money by charging a onetime 1.75 percent fee to borrowers on their loans, and charging lenders 50 to 100 basis points of their investment over the 24- to 60-month loan term, Decio said. A basis point is one-100th of a percent. Today I noticed that Globefunder.com has a new homepage. While still pre-launch, it lists 28 states with licenses and limits, explains GlobeFunder's internal Globe Ratings (minimum required credit score is 640). The fees page only lists fees payed by borrowers, with the main loan closing fee at 1.75 percent or $50 (whichever is greater). While Globefunder is not open for registration yet, the new Wiseclerk's Globefunder forum is open for your discussion. Read earlier articles on the Globefunder p2p lending service. February: Boober.nl launches the first p2p lending service in the Netherlands. September: Kiva sold out after extensive media coverage. November: Boober and Zopa launch in Italy. Prosper reaches 100 million US$ loan volume. December: Zopa US launch. Lendingclub goes nationwide. Canadian Communitylend receives 2.5M VC. In Sweden Loanland is the first p2p lending service. I will write another article on which trends to expect in p2p lending in 2008. Globefunder is (still) announcing to launch its peer-to-peer lending service soon. In my calendar I had marked October 2nd as the launch date of Globefunder.com. Unfortunately the day passed – no launch. I found a recent press release, which says launch will be in October and states Globefunder will launch for US lenders and borrowers. This is somewhat different from my early perception of the service, which based on the interview with Globefunder's CEO Brian Mullally. But the claim "Online, no-wait funding for qualified borrowers" does sound interesting. No news on the other p2p lending services that have yet to launch, like Communitylend or Loanio. Video on the Globefunder.com business model. Globefunder team says it is aiming for millions of loans requiring full scalability of system. As reported by Venturebeat and Microcapital.org Globefunder raised 1.5 Mio. US$ in venture capital (seed financing). P2P-banking recently did an interview with Globefunder CEO Brian Mullally. Globefunder is hiring – see a full page ad for positions in Microfinance Insights (found via iPienso).